The Frenchman Benoît Battistelli was irritated during a critical interview with Secretary Martijn van Dam (Economic Affairs, Labour Party) and walked away. The President of the European Patent Office in Rijswijk, the Frenchman Benoît Battistelli, showed his infamous temper this week in The Hague. Battistelli (65) was irritated during a critical interview with Secretary Martijn van Dam (Economic Affairs, Labour Party). After half an hour Battistelli was angry and he left the office of the Secretary of State in the Ministry. Sources close to the patent office confirm. The international organization in The Netherlands, Germany, Austria and Belgium (7,000 employees) accepts patent applications and grants European patents. But the patent office is mainly in the news because of the ongoing conflict between Battistelli and the union that he does not want to recognize, SUEPO. The Governing Council, the supreme body of the patent office which consists of 38 Member States today voted on external research into sanctions against trade unionists. During the interview on Friday, March 4th State Secretary Van Dam expressed his concerns about working conditions and reputational damage to the patent office. But Battistelli accused the union of a smear campaign and said that he was supported by most Member States. When the Secretary repeated his criticism because it fell on deaf ears, president Battistelli broke off the conversation with Van Dam and he left. The Secretary of State has expressed concern before about the patent office, a spokesperson for Economic Affairs responded on request. This conversation has delivered “no new insights”, the spokesman said. The spokespersons of the patent office said not to be able make statements about the conversation with the Secretary of State, because they were not informed about the course of the conversation. 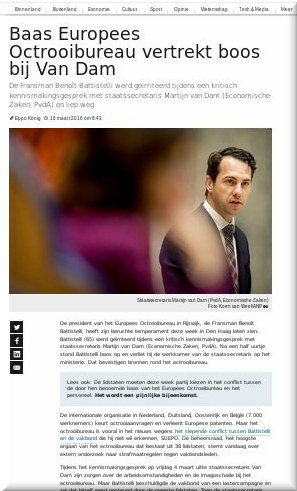 The Dutch minister is said to have raised working conditions and the damage to the patent office’s reputation during the meeting with Battistelli at the beginning of this month. He accuses the union of slander and says his position is supported by most member states. When Van Dam repeated his concerns, Battistelli broke off the conversation and walked out, the sources said.